Brazil's President Dilma Rousseff has stressed the growing importance of relations with the US after meeting President Obama at the White House. Ms Rousseff said there was potential to deepen co-operation, particularly in Brazil's booming oil and gas industry. She expressed concern about expansionist monetary policies in developed countries, saying they were impairing growth in emerging economies. President Obama said US-Brazil relations "had never been stronger". He hailed the "extraordinary progress" Brazil had made under President Rousseff and her predecessor, Luiz Inacio Lula da Silva, saying it had become "a leading voice in the world". President Rousseff is making her first official visit to the US. The main aim of her trip is to boost ties between the two biggest economies in the Americas. Ms Rousseff told reporters that she welcomed the "increasing close" trade links and growing mutual investment between Brazil and the US. She said co-operation could go much further, both in terms of trade and in "science, technology and investment". It was, no doubt, just a quirk of the White House scheduling, but it will not have escaped Brazil's attention that Dilma Rousseff was Barack Obama's second guest of the day. The first was the Easter Bunny - there for the annual egg hunt by visiting children. For this proud South American nation, appearances matter, and it's undeniable that the atmospherics of this visit have fallen short of the treatment afforded to, say, Britain's Prime Minister David Cameron last month. In the Oval Office, President Rousseff quickly showed herself to be her own woman - moving beyond pleasantries to a gentle chiding of US monetary policy, which she says is hurting her country's exports. The Brazilian leader also bluntly acknowledged that the bilateral relationship is falling short of its potential in areas of mutual interest like energy policy. That said, both sides are keen to forge closer ties - given the obvious win-win potential of bringing together two economies of continental proportions. In the long-run, Dilma's cool pragmatism may play better in Washington than the giddy showmanship of her predecessor, Luiz Inacio Lula da Silva. The relationship will have another chance to blossom at this weekend's Summit of the Americas. But she expressed concern about the international economic crisis, and in particular the depreciation in the value of currencies such as the US dollar. She said this was damaging economic growth in developing countries and amounted to a form of "exchange-rate protectionism". President Obama also said the relationship could be improved "so that not only Brazil and the US, but the world can benefit from our deeper co-operation". In recent years China has replaced the US as Brazil's biggest trading partner, and the US has made clear its desire for greater involvement in Brazil's fast-growing economy. Brazil is also seeking to boost its international standing, and wants US support for its bid for a permanent seat at the UN Security Council. Earlier on Monday US Secretary of State Hillary Clinton announced she would be visiting Brazil next week. Mrs Clinton said the US would be opening two additional consulates in Brazil - in Belo Horizonte and Porto Alegre - to keep up with the "expanding relationship". Another key focus of Ms Rousseff's visit is education, as Brazil seeks to tackle its shortage of skilled workers. The Brazilian government has unveiled a programme to send some 100,000 students overseas to study at the world's best universities, with about a fifth destined for US institutions. 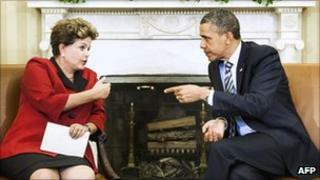 Brazil and the US have disagreed on some diplomatic issues in recent years - in particular over sanctions against Iran. Obama's Brazil visit: Fresh start for ties?